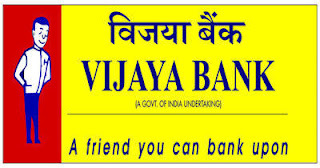 Vijaya Bank Published Recruitment Notification for Clerk (Sports Men in Clerical Cadre) Posts. View More Details About This Recruitment Including Total Posts, Posts Name, Qualification, Age Limit, How to Apply etc., are Given Below. Education Qualification : Pass in 12 Standard Examination or Equivalent, Preferably Graduates. Address : The Deputy General Manager-HRD, Vijaya Bank, Head Office, #41/2, Trinity Circle, M.G. Road, Bengaluru - 560001.